In 1928, Ora Johnson, Principal of San Antonio’s Brackenridge High School, founded a summer camp for girls at Hunt in the Texas Hill Country. She wanted to offer girls “such unusual advantages for physical, mental, and moral growth that the camp would draw from every part of the great Southwest.” With a wide program of sports (especially horseback riding), there were also courses in the arts, including music and drama. The camp was soon a success and today is into a third-generation tradition for teenage girls. In 1934, Ora’s niece, Doris Johnson, took the helm and continued the high principles and exciting activities which have made Waldemar an exemplar of what a summer camp should be. 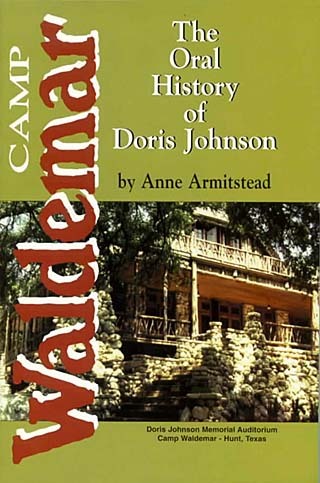 In 1980, Anne Vogelsang Armitstead, whose own daughters had enjoyed summers at Waldemar, sat with Doris Johnson for two interviews which tell the history of the camp and the people who have been associated with it through the years. This book, written as a project of Baylor University’s Institute of Oral History, is the story in Doris’ own words, providing a unique perspective on the wonders of Camp Waldemar.